As nearly all of our devices can play media, travel-sized speakers are becoming the norm. 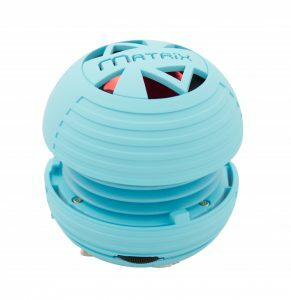 With so many to choose from, Matrix audio is standing out of the crowd. 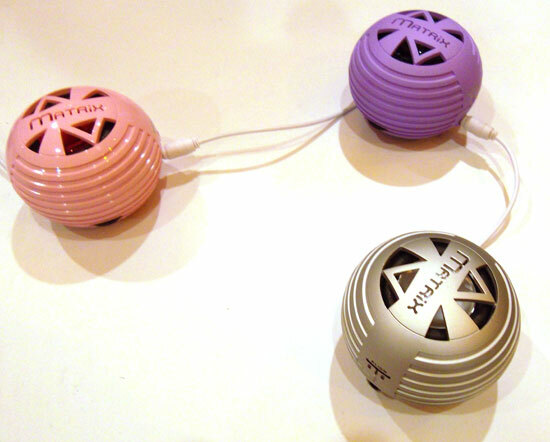 Their line of very portable speakers actually give you options when choosing amongst so many little packages. They are the next step up from your usual speakers with a 3.5 auxiliary line-in cable. There are five different speakers to choose from to suit all of your needs. The simplest one of the group is just a bit larger than a golf ball. It comes with a short 3.5mm cable to plug into your media player, smartphone or tablet. It has the Xcavated Bass Amplifier. It also has an extra line-in port for 3.5mm auxiliary cable. You can make a chain or “buddy system” of speakers where you can keep adding speakers by connecting the auxiliary cables through the available port. It charges through mini USB for playback of up to fourteen hours. The Xcavated Bass Amplifier makes all the difference. I used this speaker and cranked the volume up on both my iPod and the speaker and the sound was not distorted at all. It was the perfect beach companion. Loud enough for the group to hear without disturbing other beach goers. This little speaker packs a punch! I love the concept of this little speaker. As we want to conserve battery power on our media players and/or smartphones, we might sacrifice listening to music. 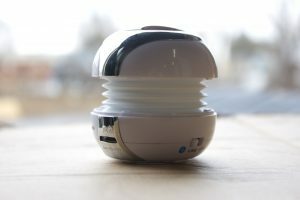 Well with the Aura portable speaker, all you need is a Micro SD card. This speaker comes with a Micro SD card slot, so you can listen and control the sound right from the speaker. With Micro SD cards being inexpensive and easy to find; the Matrix Aura portable speaker seems like a very sensible choice. The Duet speaker set offer powerful stereo sound in portable size. These sound these speakers push is overwhelming and well worth the cost. This might be the speaker to suit all of your needs. This little device is packed with useful features without sacrificing sound. It has the Xcavated Bass Amplifier as well to deliver clear mids, rich highs and undistorted bass. But this speaker also has a microphone and controls for calls. You can use this speaker as a Bluetooth speaker phone or just a speaker; your choice. These speakers are great for work stations, desks, and little corners of the home. I found it very useful at the beach, as I don’t want to lug a huge dock or radio around. It was loud enough for those hanging with me, without disturbing others. I loved that.